Jose Mourinho has admitted he has no idea when Anthony Martial will return to training as the France international appears to be trying to force his way out of Manchester United. 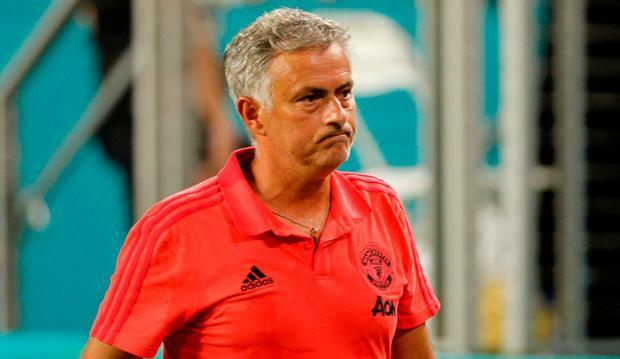 Although United finished their tour of the USA with an encouraging 2-1 victory over European champions Real Madrid, Mourinho was distracted by questions around Martial’s continued absence. The 22-year-old flew back to Paris to attend the birth of his son last week, but has refused to return to the USA to re-join the tour. And, in stressing that the team spirit and work ethic in the group had impressed him over the last fortnight, while thanking Romelu Lukaku and Marcus Rashford for agreeing to return to training three days early, there was a pointed dig at Martial. “My players [have been] amazing in their effort but we have more effort in front of us,” said Mourinho after goals from Alexis Sanchez and Ander Herrera secured the win over Real. “We go to Munich in a few days and we start the Premier League in nine days. These are the players that we have plus Lindelof, that started training two days ago, plus Marcus Rashford, Jones and Lukaku, because they gave to the group and to the team three days of their holidays. “So, they're coming back three days early to try and be available for the team [against Leicester on August 10). Martial has been a source of conflict throughout United’s pre-season schedule, but has now effectively gone AWOL, after putting in a couple of half-hearted performances against Club America and San Jose Earthquakes before asking to leave, at two days’ notice, to attend the birth of his son. Whether he will be able to force United to sell him before the close of the window, though, is highly debatable. As things stand, the only English club interested are Tottenham Hotspur and United do not want to sell to a direct rival. If he leaves, it will almost certainly have to be to a foreign club. For now, Mourinho can only focus on trying to get the players ready for the start of the season. The squad flew directly back to Manchester immediately after the game against Real and will have a day off, before returning to training on Friday. “I didn't learn anything [from this game]” Mourinho continued. “I know what Herrera, Mata and Sanchez is, I know what they are. “I know the kids are very young and need time to grow up, I know that my players gave everything and in the last 15 minutes, we are dead, and they bring on Asensio and Isco, and I thought we wouldn't resist it. “But the boys tried everything and gave everything and we always have to try to fight for the best result. “But tactically, it means nothing. We tried with the players we had available to organise the best possible team to defend against them. “We were just trying to survive and have the best possible results, but as I was saying to the players, some of my players will be in an amazing condition. Imagine Alexis Sanchez fresh, the way the man is running after playing four matches, 90 minutes, I think he is in a fantastic condition so let's look at it from a positive side and wait for Lindelof, Rashford, Lukaku and Jones, which are going to be four important players for us.